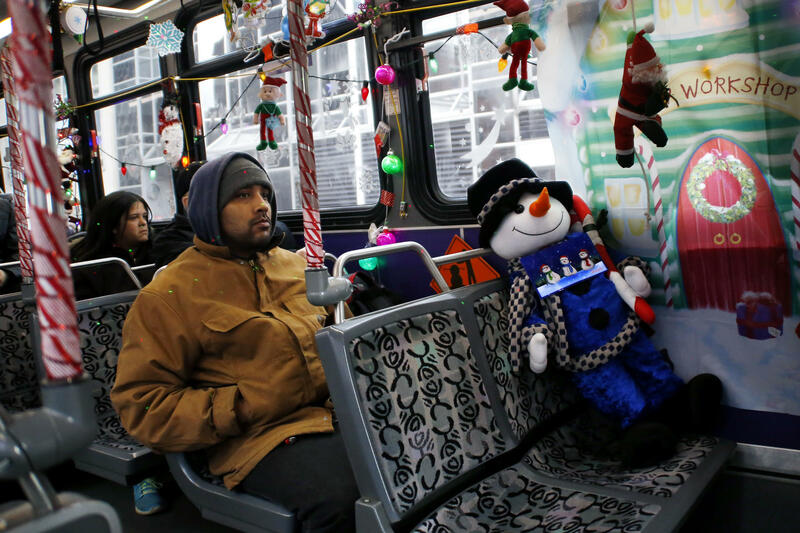 Passengers sit on the Christmas bus decorated by Port Authority driver Bill Sanfilippo, who has been decorating his rig since he was hired. He says it usually takes him 10 hours or more to put up all the lights, a life-sized Santa, Rudolph and more. Friday marks the start of Pittsburgh's Christmas season as thousands flock Downtown for Light Up Night, the city's annual Yuletide celebration marked by lights left on in buildings, plus entertainment, shopping and shows. The tradition began in 1959, but not during the holiday season. The inaugural event in April celebrated the start of baseball and the Pirates' opening day. The next year, city leaders cemented it as an annual holiday rite the Monday before Thanksgiving. That was interrupted briefly during the energy crisis of the 1970s, and upon its return, merchants opted for an extra weekend of holiday shopping. Crowds have swelled Downtown the Friday before Thanksgiving ever since. 90.5 WESA's "The Confluence" previewed the night and shared other events, exhibits, traditions and tours to fill out your Pittsburgh holiday bucket list. The Miniature Railroad & Village: Formerly available to the public only during the holidays at its creator’s home, and later at the Buhl Planetarium – is now on display year-round at the Carnegie Science Center on the North Shore. The village features hundreds of animated scenes that illustrate how people lived, worked and played in around the Steel City from the 1880s to the late 1930s, with occasional new additions. Pittsburgh Crèche: The life size Nativity scene at U.S. Steel Plaza installed in 1999 as the only authorized replica of the crèche on display in St Peter’s Square in Vatican City. Its creation came 10 years after a U.S. Supreme Court ruling to remove a Nativity from the Allegheny County Courthouse nearby. A Very Merry Pittsburgh, a new exhibition at the Heinz History Center featuring original artifacts from window displays at Kaufmann’s/Macy’s, the Santaland mailbox from Kaufmann’s, where thousands of Pittsburgh children mailed their Christmas wish lists to the North Pole, iconic city decorations, historic toys spanning the 1940s to the 2000s and more. Annual Carnegie Trees and Presepio exhibition in the Carnegie Museum of Art’s Hall of Architecture, which is filled with towering Colorado spruce trees adorned with handcrafted ornaments and flanking the museum’s Neapolitan presepio Nativity scene. The presepio was handcrafted depicting a 18th century Italian village life between 1700 and 1830. The outdoor Ice Rink at PPG Place, first opened in December 2001, is estimated to be about 67 percent larger than the one at Rockefeller Center in New York City. Nationality Rooms at the University of Pittsburgh’s Cathedral of Learning: 30 classrooms representing the cultures of various groups that settled in Allegheny County get decked out with traditional holiday decor. PPG Wintergarden’s “Spirits of Giving From Around the World” exhibit: A display of culturally representative life-size Santas and original paintings depicting holiday celebrations around the world. Kennywood Holiday Lights: See more than two million lights and visit Santa via the Gingerbread Express. Miracle Bar: This year, the annual pop-up bar returns in Market Square. And WESA's favorite holiday tradition? Join veteran host Kevin Gavin for the 41st Annual Christmas All Request Show airing live on WESA on Friday, Dec. 22. Did we miss anything? Send your suggestions here and we'll update the list throughout the 2017 season. Downtown Pittsburgh’s holiday traditions have changed over the years. But starting Saturday, a new exhibit at the Heinz History Center takes visitors back in time. 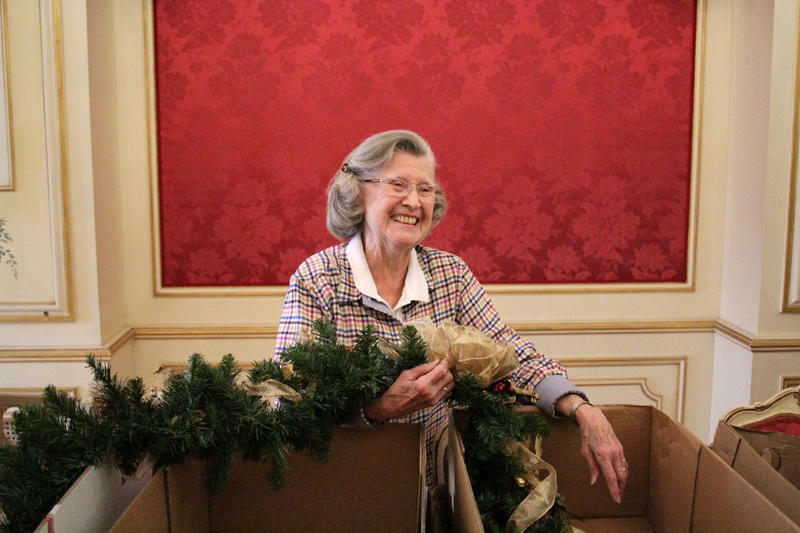 Holiday traditions from around the globe converge at the University of Pittsburgh’s Cathedral of Learning inside its Nationality Rooms, a collection of 30 classrooms representing the cultures of various groups that settled in Allegheny County. 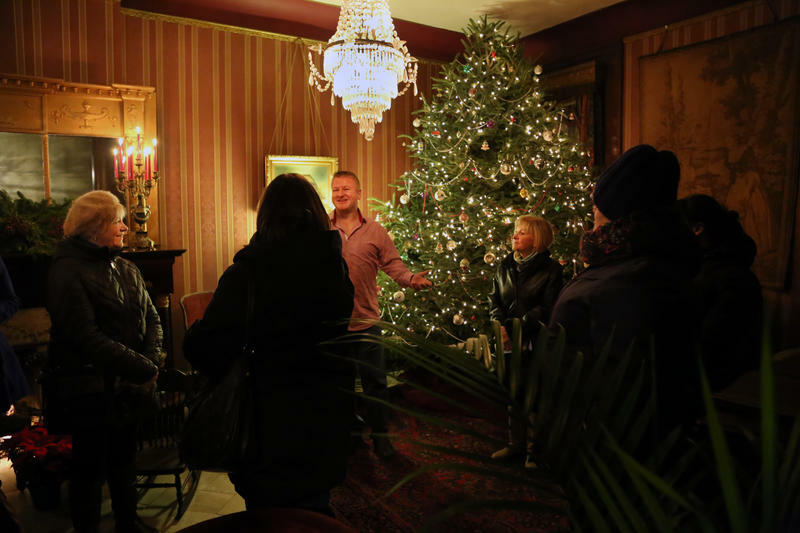 A lot has changed over its 35 year history, but the Old Allegheny Victorian Christmas House Tour has always started on Beech Avenue at Calvary United Methodist Church.